Mac OS X 10.5 "Leopard", released in October 2007, is a successful operating system that brought numerous improvements to the Mac. Things like Boot Camp, Core Animation, more 64-bit support, Exposé, Quick Look, Time Machine, OpenGL improvements, etc. This powerhouse OS brought major new features to new Macs - and to older Macs (going back to 2002) with PowerPC G4 CPUs and AGP graphics. Could Mac OS X 10.6 "Leopard" have inspired Vista's Aero interface? Windows Vista, released to retail in January 2007, wasn't a total slouch. It also brought new features, like the Aero interface. (Where have I seen that kind of eye candy before? Maybe it was in the Aqua interface - used by Apple starting with Mac OS X 10.0 in 2000 - and larger icons up to 256 x 256 pixels (Mac OS X 10.5 icons only go up to 128 x 128.) Microsoft shows it knows how to beat Apple on important features like this. 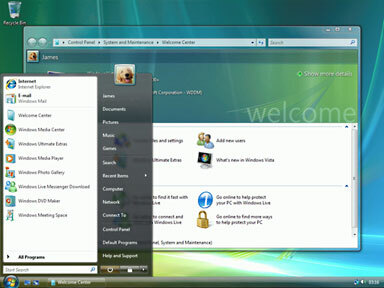 Other Vista features include a new Start menu (yawn! ), a Windows Movie Maker update (it first came with Windows Me back in 2000, where it was a copy of iMovie, which came out in 1999 and ran under Mac OS 8). Vista has better security than Windows XP (with no Mac viruses in the wild, that is hard to compare). It came with Windows Media Player 11 - again nothing new, but a nice improvement. In fact, d except for those features copied from the Mac, the list is short on truly new and innovative features. At best, Vista should have been a point release of XP (e.g. Windows XP 1.1). Unfortunately for Microsoft, Vista has such poorly optimized code that for most consumers it was actually a negative point release (e.g., Windows XP -0.1). Apple poured in virtualization technologies, video acceleration, 64-bit support, and helpful features. Microsoft messed up so bad trying to improve stuff that a lot of people wanted to stick with XP instead of upgrading. It is upon this foundation that we have Apple and Microsoft releasing their next round of operating system improvements. With Windows 7, Microsoft will have caught up to Mac OS X, somewhere between versions 10.4 and 10.5. There is simply no contest between the two operating systems. Windows still has a long ways to go to completely catch up with Mac OS X 10.5. The power of Mac OS X 10.6 "Snow Leopard" with fully integrated 64-bit support, Grand Central Dispatch, OpenCL, QuickTime X, and Microsoft Exchange support is way out past Windows 7. Maybe when Midori, Microsoft's planned post-Windows operating system, comes out, Microsoft can try to catch up with Snow Leopard. By then, Apple will have moved forward again - still leaving Microsoft behind.